Great central location. Clean beautiful facilities. Love everything, clean apartment; Master room with bathroom attached. New utilities, comfortable bathroom; cozy bedroom with comfortable bed. 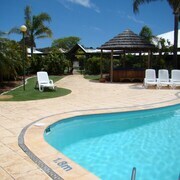 Really peaceful bush setting but close enough to Dunsborough, beaches and other local attractions. Had a wonderful stay. Very clean park. The service was awesome. The rooms were re done up. New beds that made you want to take them home. Located at one end of the town but close enough for local aminities. Excellent condition and just want we needed for our stay in the area. Would highly recommend it. You always said you would go on a dream holiday someday. Now, someday is here. But you don’t just want to dip your toe into the trip of a lifetime, you want to cannonball into the deep end. Go ahead, unplug and unwind in style. When you book one of our Dunsborough holiday rentals, the ordinary is in the rearview. Instead of sharing your vacation with hundreds of hotel guests, you get to take advantage of all the space at your private apartment. You also get to enjoy all the amenities of a private residence for a truly unique and memorable stay. Why don’t you take off your shoes and settle in for a while? Your holiday just got upgraded. As much as you love your vacation rental, it’s always good to get out and explore to soak up Dunsborough. Live like a local: Eat regional food, cheer on the home team, and visit the best cultural attractions in town. No matter the season, there is always something going on in Dunsborough. Seeing all the best attractions is bound to make you fall in love with Dunsborough. Who knows, you may even be tempted to extend your stay. There’s a reason home rentals are so popular here—after a long day of exploration, going back to your very own living room to stretch out is a dream come true. It’s your escape so why share it? You deserve your own slice of paradise. Booking your holiday rental on Expedia is simple and safe. Just pick your dates to search for the perfect property and book securely. We let you contact the property owner directly to make any special arrangements. All that’s left to do is show up with bells on and have a memorable vacation. 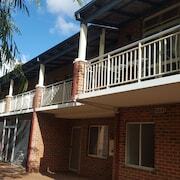 With all the amenities available in Dunsborough short-term rentals, that won’t be hard to do.